The Most Affordable And Exciting Way To Experience Jerusalem! Which JLM CityPass Is Right for You? What Sites and attractions are included? The Western Wall (the Kotel in Hebrew) is impressive, but its greatness is truly discovered when you descend underground to the Western Wall Tunnels. The tunnels run along approximately 488 meters of the Western Wall, giving visitors a taste for the challenge that stood before Herod the Great during this biggest of all his immense building projects—the expansion of the Temple Mount. One such example is the famous western stone which is 14 meters long and weighs almost 570 tons. The walk is divided into two parts: The Northern Rampart’s Walk ascends at Jaffa Gate and descends at New Gate, Herod’s Gate or Lion’s Gate. The Southern Ramparts Walk ascends at Jaffa Gate and descends at Zion Gate or Dung Gate. This historic location is where King David established his capital. Today, the City of David is a vibrant center of activity. The nighttime presentation, Hallelujah, uses advanced projection technology to tell the riveting story of rebuilding Jerusalem. The Tower of David (also known as David’s Citadel) is one of Jerusalem’s most well-known national heritage sites and it houses important archaeological ruins, dating back almost 3,000 years. Located just by Jaffa Gate, at the entrance to the Old City, this ancient fortress was originally built in the 2nd century BCE to strategically strengthen the city’s defense. The Bible Lands Museum prides itself on being the only history museum in the world that documents the development of civilization from the biblical point of view. Focusing on the cultures of the Ancient Near East, the museum holds one of the world’s most fascinating collections of antiques and archaeological treasures that span history from the dawn of civilization through the rise of Christianity and the Talmudic period, ranging from the prehistoric period to the Mishna and Talmud period. About 9,000 square-meters beneath the Old City houses lies a most remarkable cave, both in size and beauty. This legendary cave, known as Zedekiah’s Cave, one of the most spectacular sites in Jerusalem, served in antiquity as a quarry for the massive stones that built the Temple and its mount under King Solomon. Come discover treasure! Emek Tzurim National Park offers a special attraction – anyone can be an archaeologist for a day and try to find real artifacts from the Temple Mount soil, a fun enjoyable experience for the whole family. 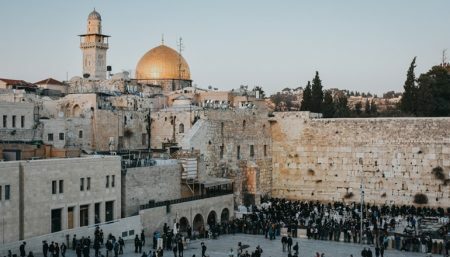 a new transportation service that takes visitors from Jaffa Gate to the Western Wall that will offer rich audio tour experience and greatly increase accessibility to the Western Wall for the disabled. Although you can explore Jerusalem for days on end and barely scratch the surface, if you’re interested in getting the big picture on the city and its history in just under half an hour, hop onto the Time Elevator. The viewer here is not just a passive spectator in the arena of history; the motion-based seating moves the audience with the turbulence of the times, while surround-sound and a wealth of surprising effects bring the viewer even closer to the action, making the experience all the more immersive. Plan a memorable visit to Yad Vashem, the World Holocaust Remembrance Center. Immerse yourself in the history of one the most devastating chapters in the modern era and take part in meaningful and dynamic commemoration of the Holocaust and its victims as you explore the one-of-a-kind museums, inspiring outdoor monuments, memorials, gardens and sculptures throughout the 45-acre campus, situated on Jerusalem’s picturesque Mount of Remembrance. The L.A. Mayer Museum for Islamic Art is a unique museum that offers visitors the opportunity to come face to face with the world of Islamic art. The museum displays thousands of art objects from different historical events, dynasties and conquest inside the Islamic world. The museum’s collections include jewelry, gold and silver ware, musical instruments, ceramics, scientific instruments, spectacular calligraphy scrolls, delicate glass vessels, and artifacts made of copper, metal, wood and ivory. The FOZ Museum tells the story of non-Jewish support for the State of Israel and the Jewish people. The tour is 1 hr long inviting guests to meet non Jewish Zionists through colorful exhibits and state of the art interactive displays that combine music, visuals and sound. This is possible due to the Israeli made groundbreaking technology that allows all to take part in the Zionist story unfolding before their very eyes. The Begin Museum is not just a museum, it’s an experience. Using the life story of the 6th Prime Minister of Israel, it tells the story of one of the most fascinating episodes of Israel’s history. The visitor is taken on a journey through history using reconstructions, original items and rare documentary films as well as reenactments, interactive elements, dramatic lighting and an inspiring soundtrack. ZuZu Tourism is rated one of the world’s top ten tourism companies (6 years in a row!) The company has been awarded TripAdvisor’s Certificate of Excellence for its experiential tours, and it is the most experienced Segway tourism company, operating both inside Jerusalem and Tel Aviv. ZUZU offers Segway tours, cycling tours, and other exclusive tours in a variety of themes and locations around Jerusalem. The Bloomfield Science Museum is the place for learning with a twist, making it a great place for a family outing. A number of exhibitions are presented simultaneously with interactive displays that invite children and parents to touch, experience, and enjoy science. The Herzl Museum opened in honor of 100 years since the passing of Theodor Herzl and it offers an opportunity to take an in-depth look at the life and activities of the founder of the modern Zionist movement. The museum is situated on Mount Herzl, close to Herzl’s gravesite and the graves of many other leaders of Israel and war martyrs. 15% discount on food tours in Jerusalem. Choose Your Jlm CityPass Now!